Despite the fact that the sound booth at the Opera House is set at least two thirds of the way to the back of the room, separated from the floor by railings and several steps of elevation, it was still carefully covered with a taped-down blue tarp. When as much (fake) blood, ejaculate, vomit and other questionable substances as Gwar carry around with them are about to be unloaded onto an audience, you can't be too careful. Gwar shows are unlike other metal shows, and not just because of the blood; okay, partially because of the blood, but it's more than that. Their shows are spectacles with huge rubber costumes and weapons and characters designed to be ripped apart on stage, weaving complex narratives that make the shows as much theatre as they are concert. Gwar pits are an ecstatic experience, joyful and chaotic and utterly messy. It's one of the rare occasions when metal shows are filled with more people wearing white shirts than black; after all, the blood shows up better that way. It's a challenge to prepare a crowd for Gwar to come on, to be more than just something to wait through, and the opening bands each gave valiant efforts, to varying degrees of success. With a short set and massive, Sabbath-esque riffs, Austin-based aggressors American Sharks kept the energy level high and seemed utterly thrilled to be there the entire time they were on stage. The fancy, crunchy sludge of their guitar tone translated remarkably well in the packed venue. In contrast, Corrosion of Conformity's set dragged a little, hampered by an extended sound check and a lack of any real dangerous edge. The performance itself had decent energy, and the band's onstage chemistry is good, but the overall execution somehow felt tired, especially in the middle of the set when they turned to slower numbers like "Psychic Vampire." From the moment that the crowd broke out into a massive singalong of Black Sabbath's "War Pigs," Gwar had the audience in the palm of their blood-dripping, claw-tipped hands. This is the first tour the band has launched since the death of Dave Brockie, founding member and longtime frontman under the guise of Oderus Urungus, and the question of whether it would be possible for the band to continue without Brockie helming the project has been a serious one. What came across in this set was that Gwar is more than simply one person; it is an idea and a collective, a glorious viscera-drenched engine that will continue to chug forward like a siege engine. It's a beautiful thing to behold. There is no single front person of the band now; Blöthar and Vulvatron (who is an exceptional addition to the band, fierce and crass, wielding both her giant mace and voice as weapons) effectively share the duties. In the absence of a king, Gwar has become a republic. 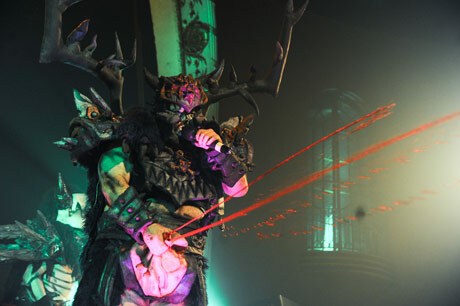 The entire performance, the narrative and the theatre of it, revolved around the loss of Oderus, as the band travels through time and space searching for him, attempting various bloody rituals to get him back, fighting giant monsters who claim to have slain the great Scumdog of the Universe, and eventually laying Oderus' memory to rest. There was an incredibly moving moment in which every member of the band together carried out Oderus' sword, Unt Lick, onto the stage like a funeral procession, leading the crowd in a scream their fallen leader "could hear from Valhalla." The band closed their encore with their cover of the Pet Shop Boys' "West End Girls" (which they originally performed for the AV Club's "Undercover" series) which closes with a tribute to Brockie. The blood-drenched pit that raged in front of the stage the entire set was particularly special this evening; every elbow thrown and pair of earplugs lost was dedicated to Oderus' brutal, violence, hilarious memory. Exactly as it should be.